Zoom expert Raul Montes will take you on a grand tour of the Zoom product suite. We'll cover such features as calendar integrations, recording, screen sharing, annotation, virtual backgrounds, and more! What's more, you'll receive an overview of our desktop and mobile meetings, IM service, webinar platform, conference room solutions (Zoom Rooms and H.323/SIP Connector), and Zoom's premium audio plan. 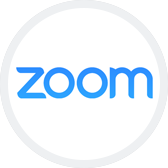 Hi there, You are invited to a Zoom webinar. Register in advance for this webinar: https://www.zoom.us/webinar/register/weeklylivedemo After registering, you will receive a confirmation email containing information about joining the webinar.